I was interviewed by Paco Garcia on the GMS Magazine Podcast over the weekend. 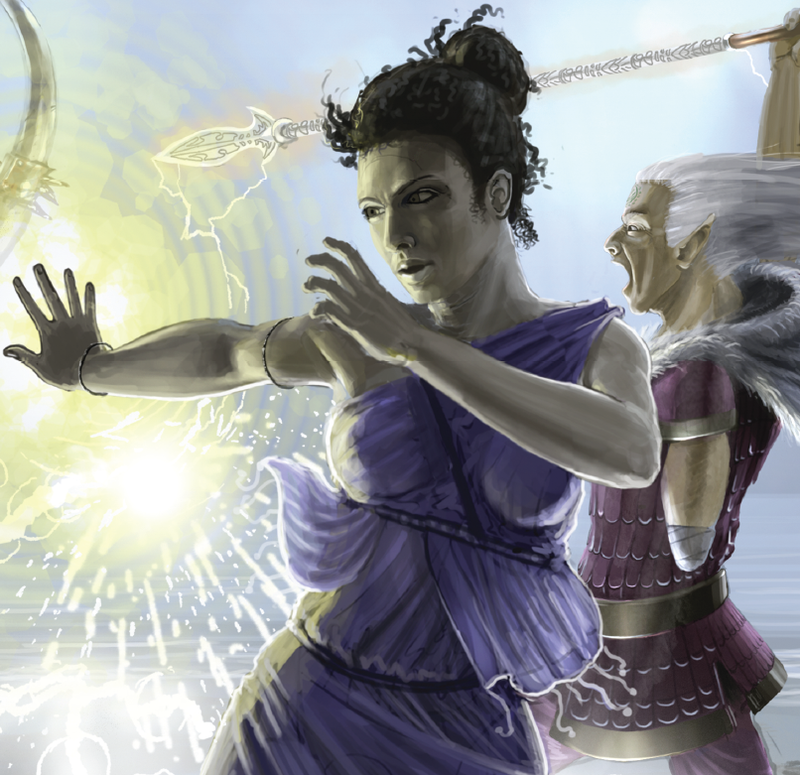 We discuss the development of Sertorius, the spell system and why we decided to use emotions as the foundation of magic in the setting. 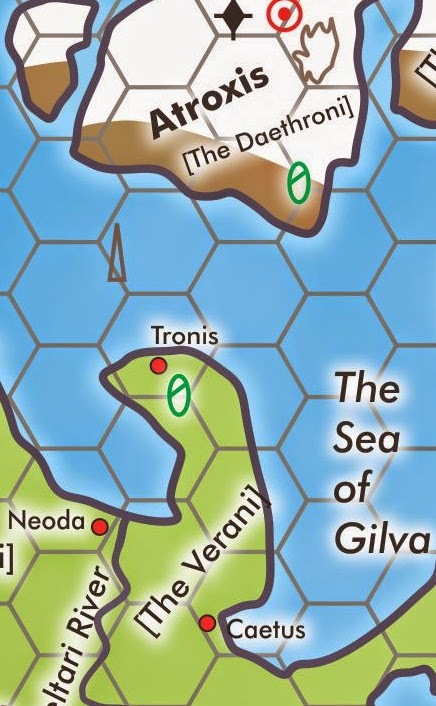 We started a new Sertorius campaign a few weeks ago, set far to the North in the region around Atroxis. The game is being run by Bill Butler with 6-7 players. I am going to attempt to describe the campaign events but because I am a player I am going by memory and do not have access to the GM notes. People have asked what a typical session is like, so hopefully this helps give them some idea. The game began in Neoda, a settlement under the control of the orc King Malka who has united all the orc tribes in the area. 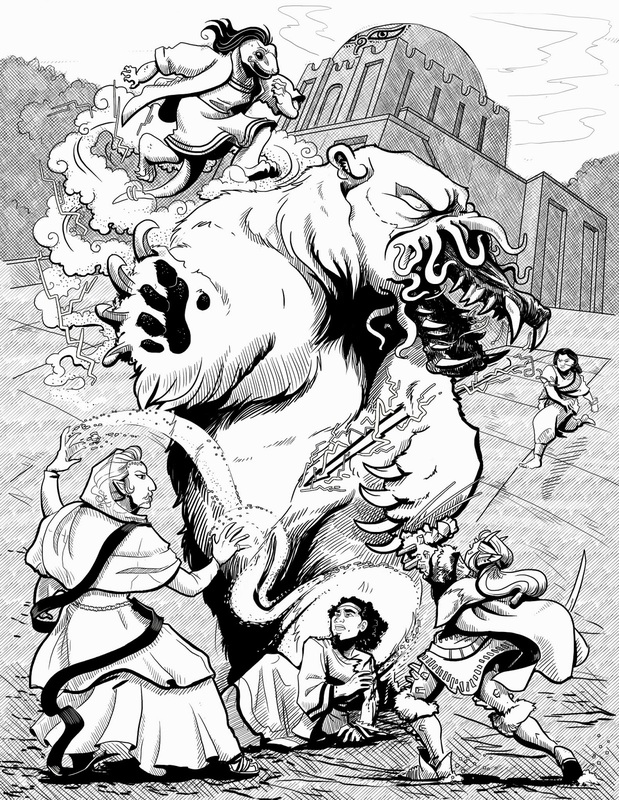 Malka and his followers worship Ozias, who resides on the isle of Atroxis and can raise the dead. Our group was called to Neoda to help the King acquire two ancient crowns believed to be on a small island further north inhabited by giants and trolls. -Shillek, a Halfling from the Shahr Republic who has business in the North. -Orto Turanus, a one-armed Orc scholar from Caelum. -Ah-Sri, a Hasri raised by Humans in Ronia. -Varia, a Human from East. In Neoda we met with one of King Malka's grand-daughters who had a number of soldiers under her command. She told us the King needed Sertori to retrieve the crowns and it would involve a long expedition to the north through troll and giant infested lands. The rewards were plentiful and generous so we agreed and set out by ship with the King's grand-daughter and about 12 soldiers. We arrived on the Northern Island, where Malka had a small outpost of men. They gave us food and shelter for the night, then we continued north through the snow following a map the King's grand-daughter had obtained prior to meeting us. It was only hours to reach the spot where we believed the crowns were located, but it was dangerous. We were nearly engulfed by an avalanche but were mostly saved by the quick thinking of Shillek who used an earth moving spell to redirect the snow before it engulfed us completely. Still many men were injured. A few hours later we came upon a band of giants, but managed to hide ourselves and they trekked around us. Later we found a village of giants. Before we had set out, I had performed a divination and had a vision of a friendly village of giants. Thinking this might be it, we entered the village. The village elder offered us food and shelter. We learned about the other local giant tribes from him (most of them were hostile and enjoyed Orc meat). We also learned that the spot we sought was a tomb, with a strange curse upon that killed anyone who entered. We then set out and made our way to the tomb. Poro used the spell Servitor to create a scout and sent him into the tomb after we had torn down the entrance. He traveled far, about seven miles and eventually found a door we believed was significant. However when we went in ourselves we quickly learned that just being in the tomb drained out bodies, making us ill. We spent a while strategizing, thinking of ways around the problem. Eventually it was agreed two of us would go in to toward the door where the Servitor had reached regardless of the consequences. Aetos and Enos both agreed to go. Before descending, Ah-Sri cast Taiboon's Magic Emblems (a spell from the first Book of the Archon which should be out in the next couple of months) to grant us Beast Strength. We ran as fast as we could to the door, thankfully both rolling 10s on our Endurance rolls. However the journey drained us, depleting our health permanently the further we went. It was as if something in the tomb was sucking the life from our bodies. We reached the door, but greatly weakened. The Servitor was still there and the three of us smashed down the entrance. Inside we saw two crystal sarcophagi that contained trolls, surrounded by walls with ancient writing and symbols that vaguely resembled images of the god Ramos. Clearly it was quite ancient, possibly from before the time of the Ogre Kingsoms. One had a crown of gold. We could sense this was where our life was being pulled. The Servitor smashed the first sarcophagus open, and I took the crown from the troll. It awakened and immediately attacked. Aetos used Bolt of Fury and despite blasting a hole through its chest, the Troll continued to smash the Servitor. I stepped back and fired an arrow (not having any combat spells) striking the Troll. The servitor then set to work smashing open the second Sarcophagus. The Troll then pounded Aetos with his fist. Aetos cast another bolt but missed. I struck with another arrow. The Troll grabbed the Servitor and crushed him against a wall, breaking him up into bits. Aetos cast another bolt, but this time at the crystal sarcophagus, which caused it to shatter. I saw a small crown of smoke around the second troll's head (this one apparently a female) and grabbed it as well. 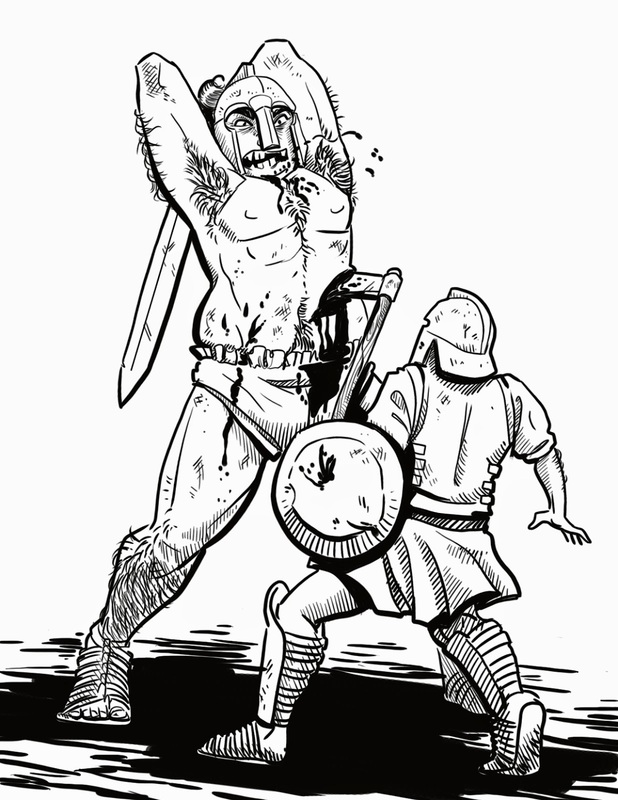 As the second troll awakened, the first slammed its hands into Aetos caving in his ribs and killing him. I ran as fast as I could toward the entrance to the tomb. The first troll was injured and stayed behind, but the newly awakened female troll chased me down the tunnel for about a mile. We resolved this through several Speed rolls and one Endurance roll. I managed to just stay ahead of the troll and tired her out enough that I was able to escape. But I had lost much of my health. I told the others what happened and we agreed we should go back in to kill the trolls, get Aetos' body and hopefully find a way to restore my health. Once inside we realized that destroying the crystal sarcophagi eliminated the life draining effect of the tomb. Orto cast Cold Furious Gaze on the female troll, which held her in place while the soldiers finished her off. The second troll we surrounded and speared. Several hours later my health started to return. Before setting back to the ship with the two crowns I decided to cast a spell called Awakened Death (also from Book of the Archon) on Aetos' body. This brings back the recently departed as undead and sends them against one enemy of your choice. Not having any enemies of my own, I asked Malka's grand-daugher if the King had anyone he needed destroyed. She mentioned an impending invasion of Caelum, so we raised Aetos as a ghoul and commanded him to kill General Brogustu. This measure might seem a harsh way to deal with a fallen comrade, but where our characters are from, the local god is a Lich, and raising him as an undead to perform one last task for the King was a kind of honor. We then returned to the friendly village of giants, where we talked the Elder into migrating his people to our lands, where they could serve as elite soldiers for King Malka and be given good land. After that we set sail for Neoda. In the previous blog post, I discussed the nature of Sertori. 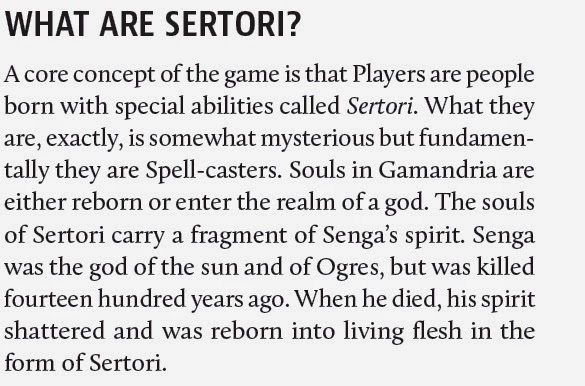 Now I want to talk a bit about the magic system in Sertorius and how spell-casting works. I should start by saying, Sertori are not scholarly wizards who painstakingly research their magic. Rather they are born with the natural ability to cast specific spells that are a part of their very soul. Each Sertori has a small fragment of the powers once possessed by the god Senga (see previous blog entry for details). As they grow in power, Sertori can become religious figureheads with followers and disciples. In Sertorius magic is based around four emotions. The Emotions are the fundamental forces of creation, used by the gods when they shaped Gamandria: Agape (Love), Deimos (Fear), Penthos (Pain) and Misos (Rage). This is reflected by your Emotion Rank, which is 0-3 in each of the Emotions. Characters have four Ranks total, allowing them to take 1 rank in each or 3 Ranks in Misos and 1 Rank in Penthos. There are a number of possible combinations here. Your rank determines how powerful spells of that type are when you cast them, but it is a double edged sword because the higher your rank, the more risk you face when casting the spell at full potency. Every Sertori begins the game with 4-6 spells (characters with one rank in each emotion gain 2 bonus spells giving them six). Sertori also have a Divinity Rating which increases as they gain followers, and this gives them more spells and access to miracles as they advance. Each spell is keyed to a particular skill. So the spell Bridge uses your Trade (Architecture) skill for casting while the spell Splintering of Yaum uses Athletics. When casting a spell you can choose to cast it normally, which produces a nice effect but doesn't expose you to any risk, or you can cast it Cathartically. When you do the later, you unleash the full potential of the spell, handling the raw forces behind them and risking your body/mind. When spells are cast Cathartically, you gain Grim points (an amount equal to your Emotion Rank on a Success, but equal to your Emotion Rank plus 2 on a failure--on a Total Success you take no Grim Points). If you take too many Grim Points then you start to undergo changes. This begins with minor mental and physical afflictions, then progresses. It culminates with the Sertori becoming a Grim: a twisted creature, a haunting force or something even more powerful. When Sertori gain enough followers they acquire Thauma (miracles). These are exceptionally powerful, allowing them to travel through time or flood entire cities. They are also depleting, bringing physical harm to the caster and requiring lengthy rest. Last post I answered the question "What is Sertorius?" Today I would like to answer the question "What are Sertori?". Sertorius is about spell-casters and these are called Sertori. They are called this because the first of their kind to appear in Gamandria (the setting of Sertorius) was an Orc tyrant named Sertorius Poro. Sertori have the inherent ability to use magic and are physically more powerful than normal people. They can be of any race, except Ogres (see below for details). In the past they were hunted and feared, because of men like Sertorius Poro. To expand on this, we need to discuss the history of Gamandria. Thousands of years ago, while the other races were still just scattered nomadic tribes, the Ogre civilization of Nong Sai thrived. This was a loose cluster of kingdoms occasionally united under a single ruler. Their enemy at the time was a place to the west called Anumar, inhabited by a race called the Slovars. The Ogres of Nong Sai worshipped the sun god Senga, while the Slovars worshipped Lorgo. In those days the gods would lead their people into battle and so the armies of Nong Sai and Anumar clashed with their deities leading the charge and assisted by other powerful entities. Fourteen hundred years ago, a king named Dosikan emerged in Nong Sai. He united his people and was on the cusp of wiping out the Slovars. According to some accounts he was persuaded by Senga's consort, the snake goddess Sarilla, to betray his god and steal the deity's powers. Whatever the details, Dosikan killed Senga with a magic blade and absorbed the Ogre god's powerful spirit using something called the Chalice of Life. Senga's soul infused Dosikan with magic, enabling him to wipeout cities or force thousands to heed his command. But it also drove him mad. 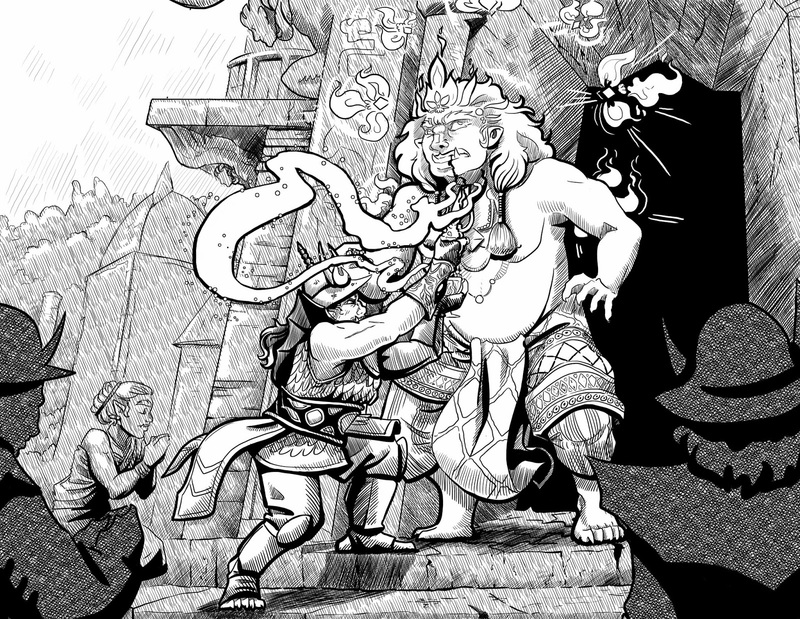 The other gods, enraged by this mortal act of defiance sent a plague of dragons upon the world to destroy Nong Sai and Dosikan died as the magic overwhelmed him. After the these events, the other races filled the vacuum left by the Ogres (who were left to wander under a great curse). When Dosikan died he unleashed Senga's spirit onto the world, but it was fragmented. These fragments reborn into flesh are called Sertori. Today Sertori exist throughout Gamandria. Some rise to positions of great power, others are held in check by organizations of Sertori, intended to create harmony between those with magic and those without. All the races can be born as Sertori, and so can animals, but Ogres suffer under a curse that deprives them of magic. Next entry I will discuss the magic system in some depth. What is the game system? 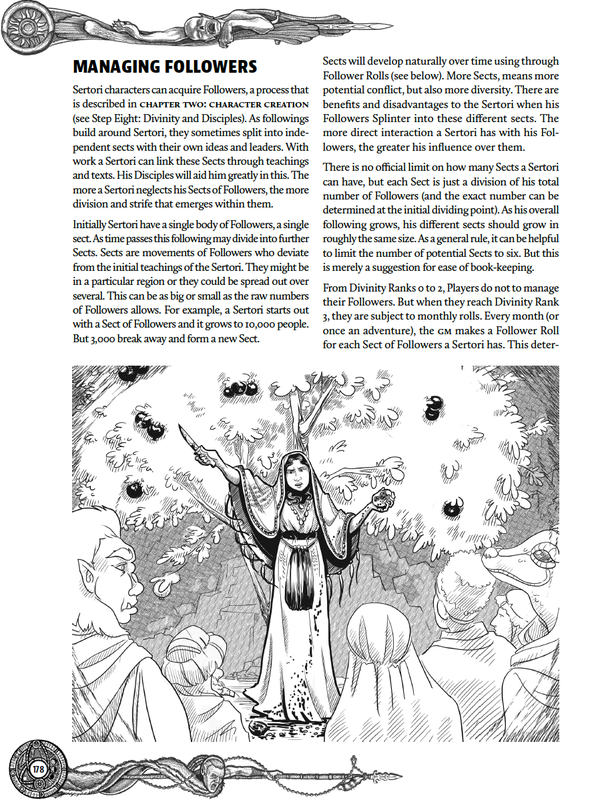 Sertorius uses the Network System, a skill-based game where you roll a number of d10 equal to your skill ranks against a Target Number and take the single highest result. The Target Number is usually one of your opponent’s core defenses or set by the GM based on the conditions. If you meet or exceed this number, you succeed. If you roll below the Target Number, then you fail. If you roll a result of 10, this is called a Total Success which gives you different benefits depending on the skill. 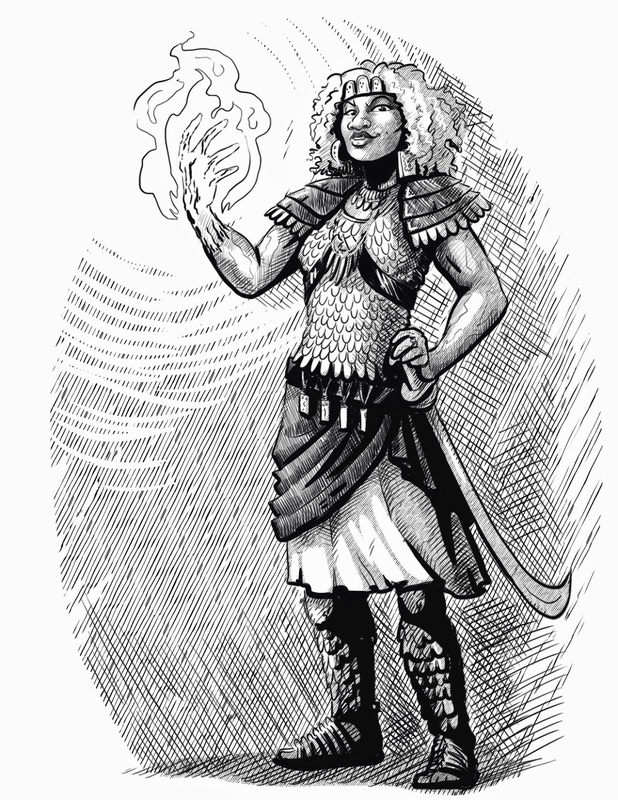 Characters in Sertorius are spell-casters, powerful beings imbued with the spirit of a long-dead god. They begin the game with 4-6 spells, gaining more as they acquire worshippers. When they gain enough followers, characters get access to special miracles called Thauma. Spells are cast using the normal skills in the game. 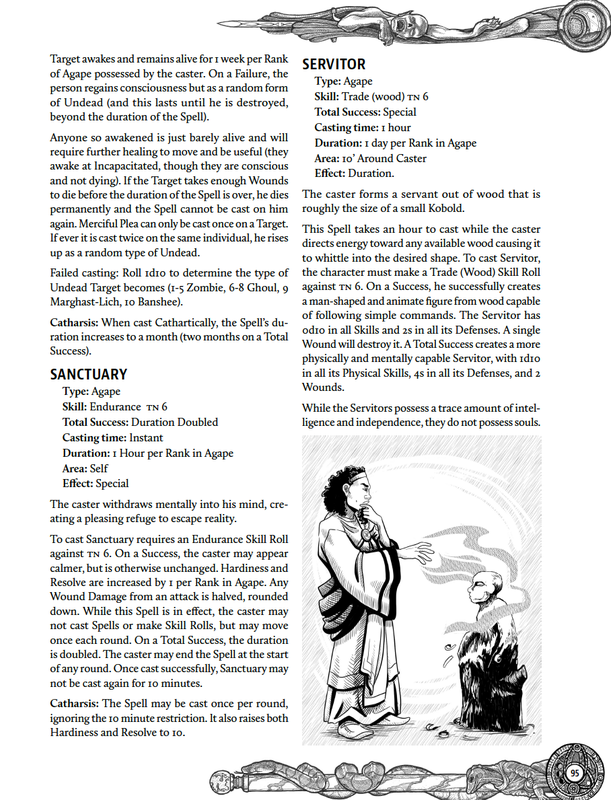 For example a spell called Servitor, which allows you to create an animated servant from wood, uses the Trade: Wood skill, while the spell Bolt of Fury uses one of the ranged combat skills. You can cast a spell as much as you want. But if you cast it at full power you expose yourself to the dangers of magic, which over time can alter your body and mind. 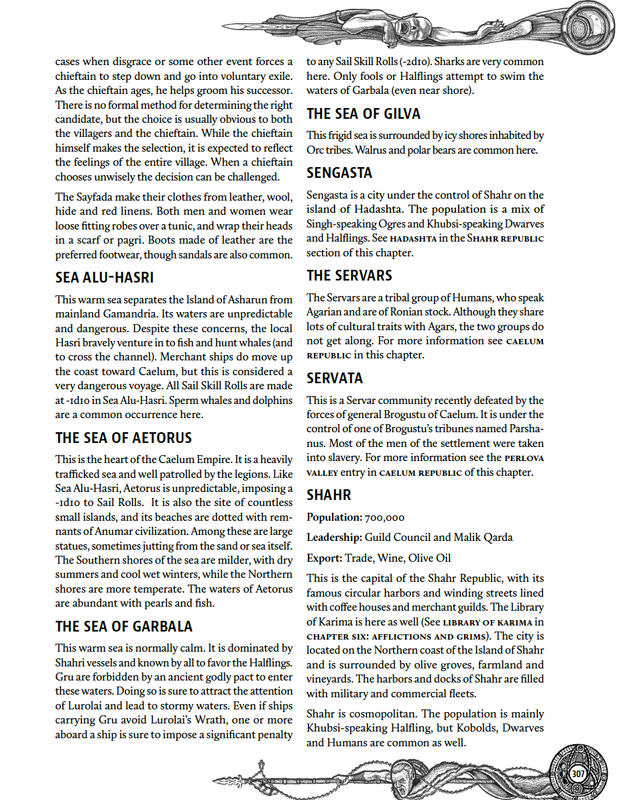 The Sertorius core book is nearly 500 pages long and is all that is required for play. 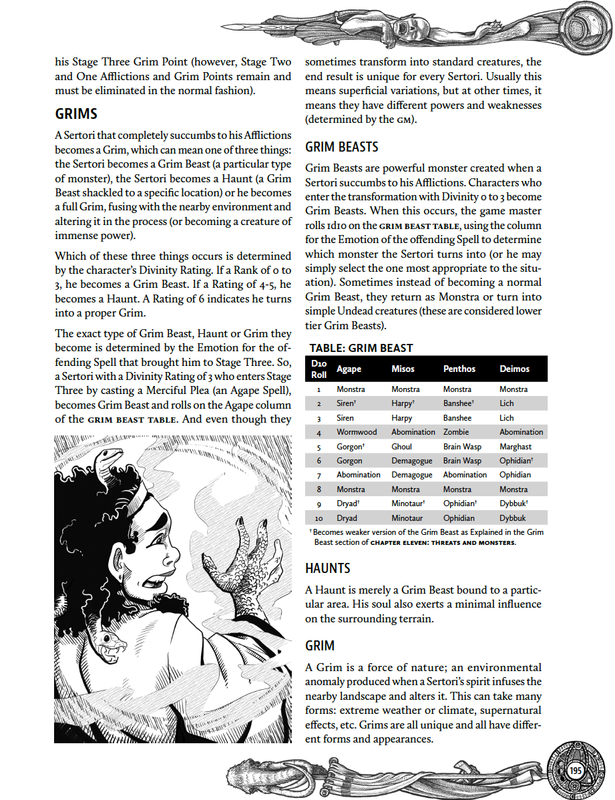 It includes a complete monster section, a complete spell section, a fully detailed list of skills, character creation, rules, equipment, etc. 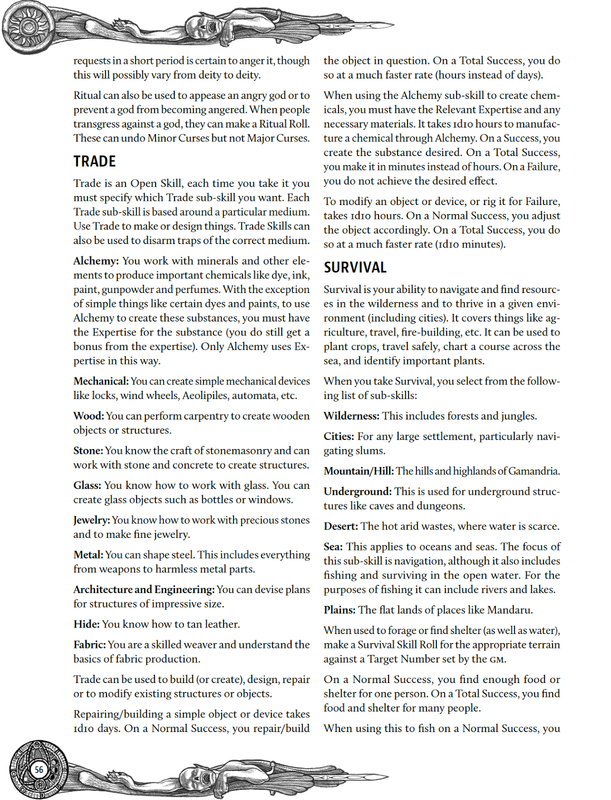 Everything you need to play the game is contained in the core book. 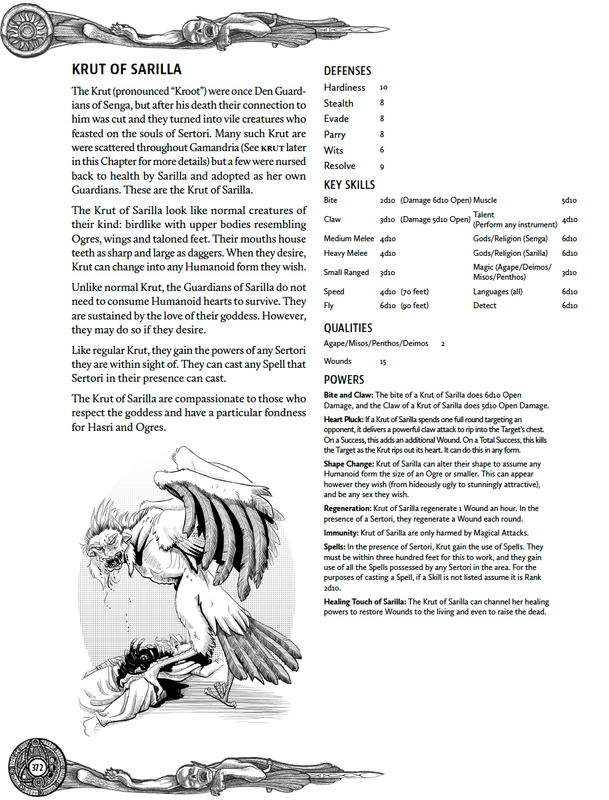 Sertorius will be available sometime in the next week or so in PDF. While the rules contain many spells, we want to encourage people to make their own spells to suit the campaign's needs. You can use the existing spells as models to create new ones. Here is an example of a custom spell by Bill Butler (on of the designers of Sertorius and co-owner of Bedrock Games). 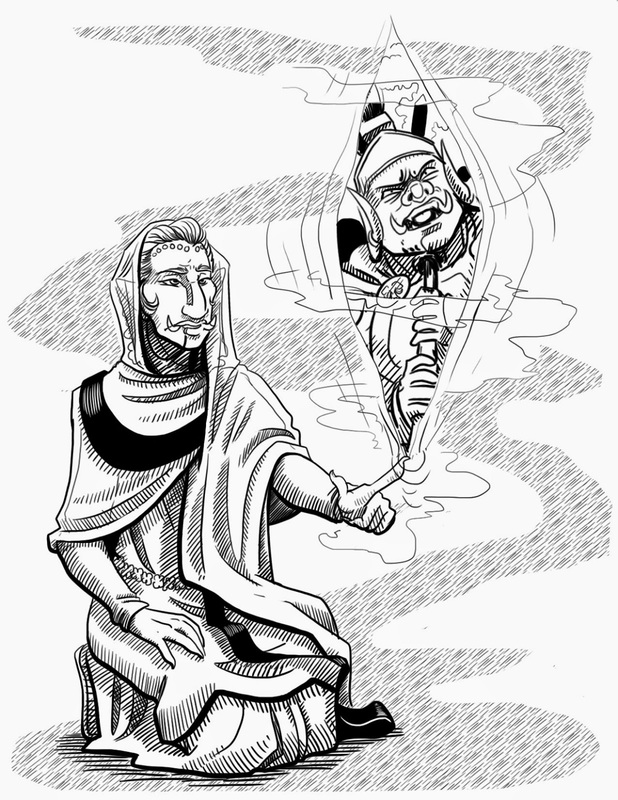 Bill is running a Sertorius campaign and one of his players was looking for a spell that enabled Sertori to turn into clouds of acid. Because he liked the idea and felt it was in keeping with the game, he created this the Acidic Cloud of Jun-Jo. This spell is relatively simple and mainly for flavor. The caster transforms his body and any clothing or other personal possessions into a roughly Ogre-sized acidic vaporous cloud that retains a vaguely humanoid shape. To cast Acidic cloud, the Sertori makes an Endurance Skill roll against TN 6. On a Success the transformation works and the cloud floats along the ground at the same speed the caster would normally move. The cloud may only harm others by contact; objects may not be picked up and spells may not be cast while in cloud form. On a failure, the spell may not be cast again for one hour, unless cast Cathartically. On a Total success the duration becomes Hours. The cloud form allows passage between narrow spaces a person could not normally squeeze through. While in cloud form, non-magic physical attacks suffer a -1d10 on skill rolls and damage rolls against the cloud. Windstorm-like effects and magic will damage the cloud normally. Once during a round a single enemy may be touched by the cloud inflicting 1d10 acid damage per rank in Emotion. The caster may end the spell at the start of any round. Catharsis: On a Cathartic casting the acid is much stronger, and inflicts 2d10 per rank in Deimos. 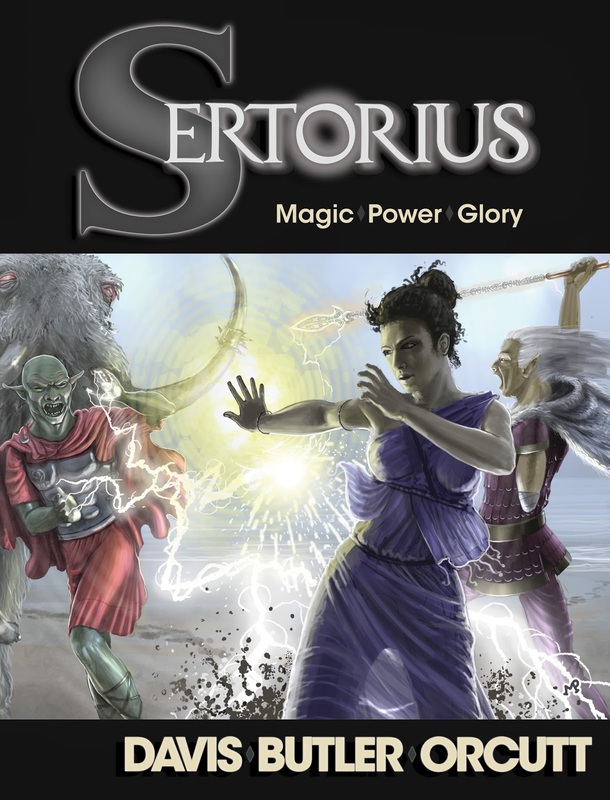 Sertorius comes out in PDF in just a few days and will be available in print sometime in Summer/Fall (for news check here: SERTORIUS NEWS). Here is a look inside the book. These are mainly screen shots from the print file, which is slightly different from the PDF (the PDF contains color maps and color chapter headers, while the print edition is all black and white). 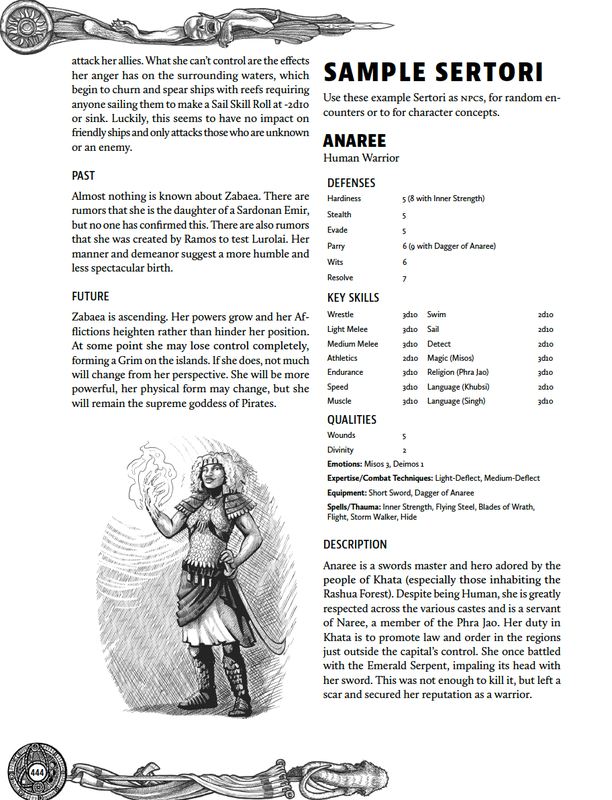 The character creation chapter is enormous, with nine races to select from, seven backgrounds, dozens of skills, and many other options (like Expertise, Flaws, etc). 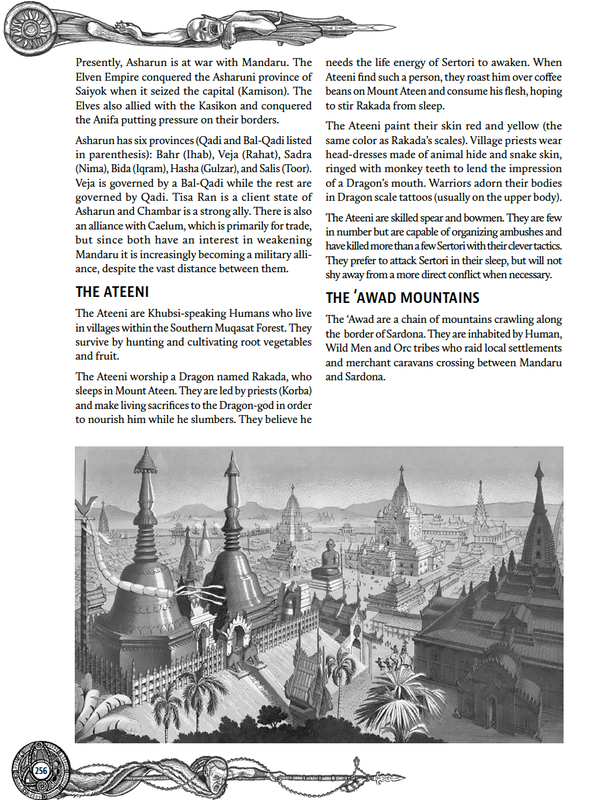 The race section includes standard fantasy races like Orcs, Kobolds, Humans, Dwarves, Elves, and Halflings but also includes new races like Gru (a savage humanoid group from the North) and Hasri (reptilian humanoids who populate the South and West). The rules are quite simple, using the d10 system employed in our other games, but modified to suit the needs of a game that includes magic. 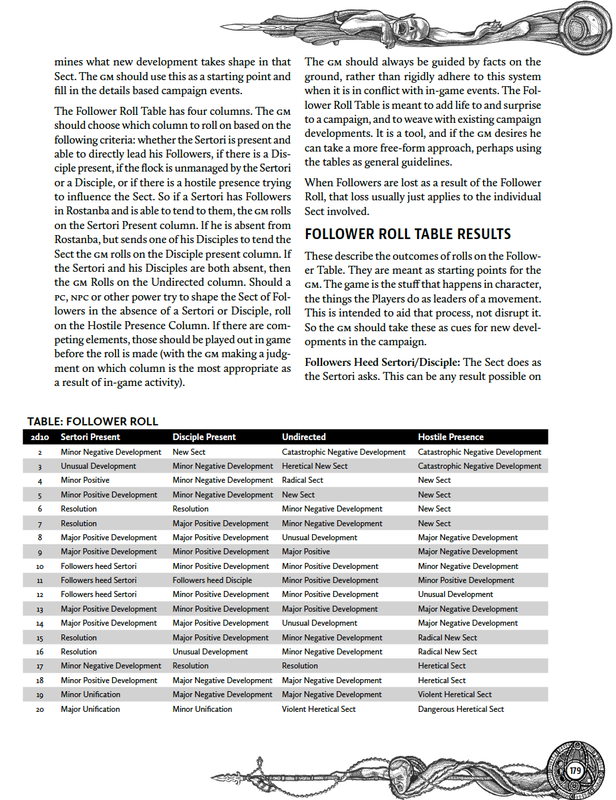 One of the more interesting mechanics is the Follower sub-system. This allows Sertori to acquire followers that is a kind of cult devoted to them. Ultimately Sertorius is a game about spell casters so there is a robust selection of spells available. 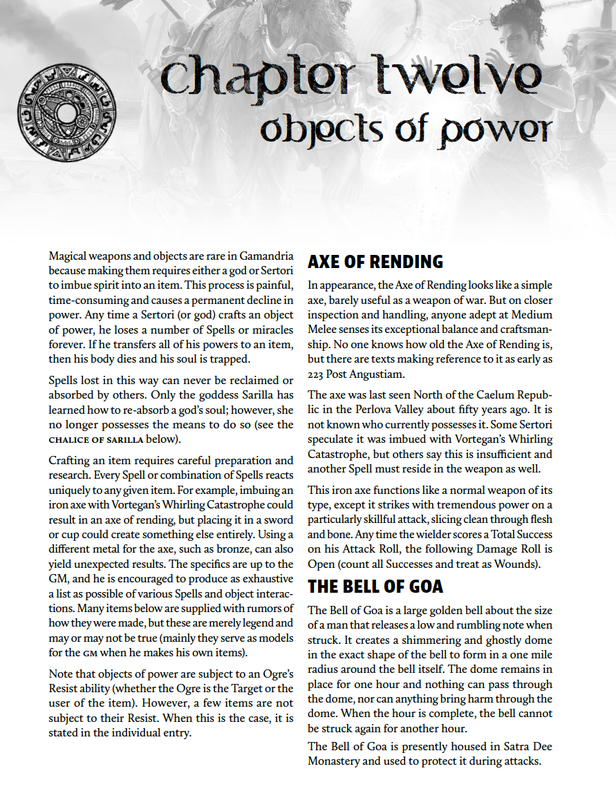 There will also be a number of free spell expansion books released in PDF. The spell system allows for continuous casting of spells but at a risk to the caster. 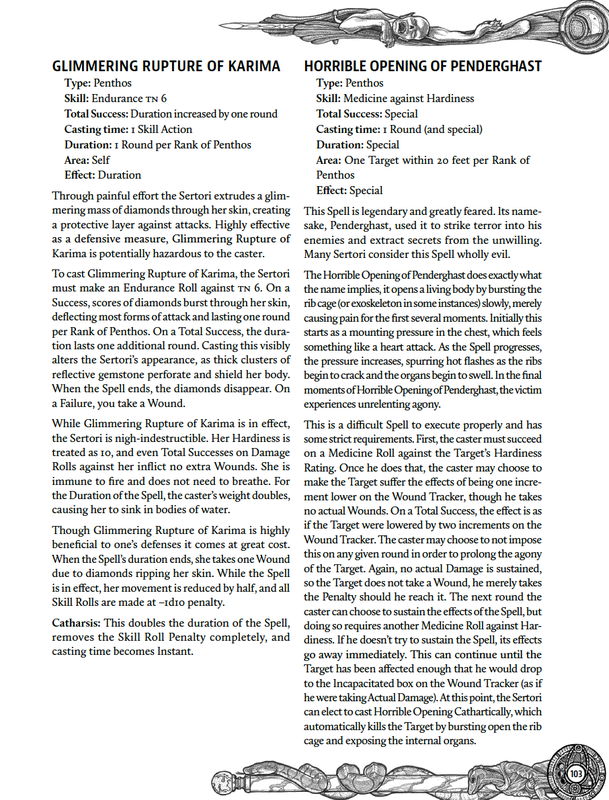 Some of our favorite spells are Glimmering Rupture of Karima, The Dance of Satree and Avalanche of Flame. 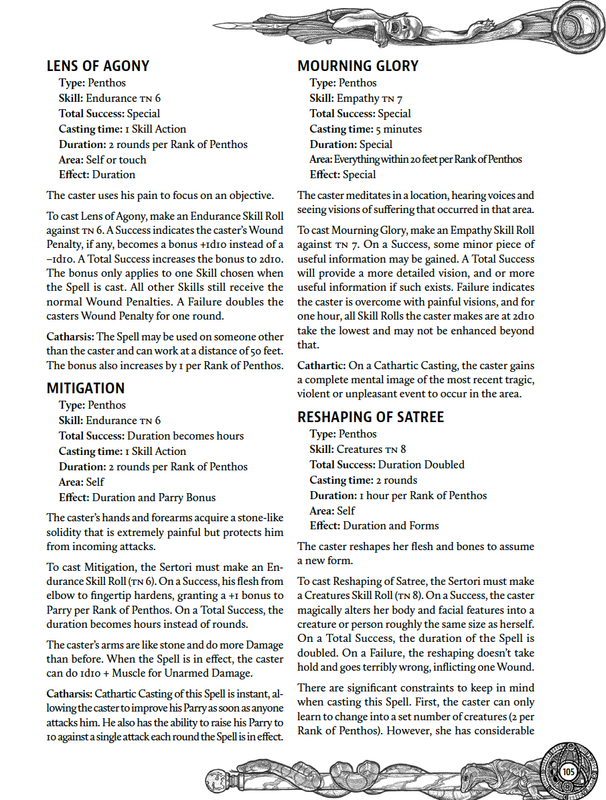 Spells come in a variety of flavors, with some suited to combat but others suited to more other areas of interest to players. 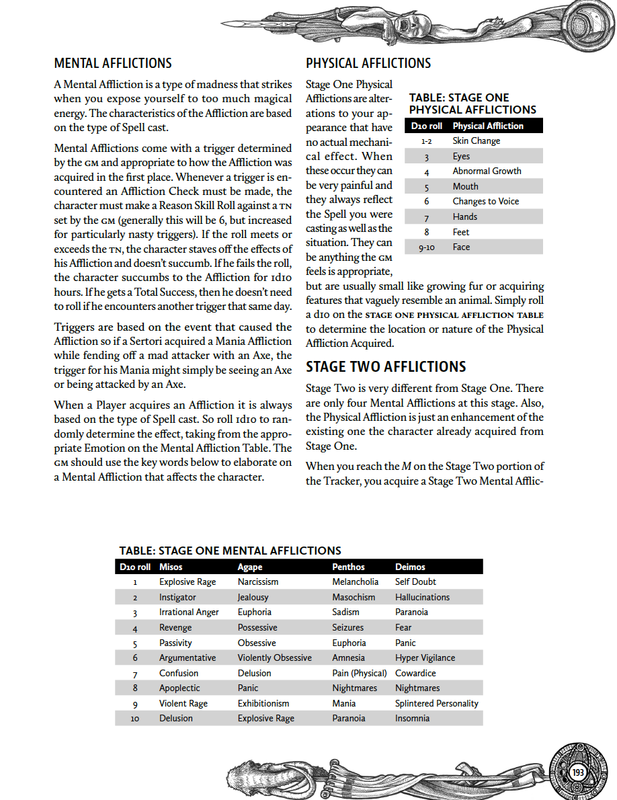 Casting spells in Sertorius comes with some risk, and there is an entire chapter devoted to the Afflictions (both mental and physical) that can befall Sertori. In the most extreme cases this turns characters into Grims, which are sentient environmental effects or hauntings. For example a character who succumbs to his magic and turns into a powerful Grim might create an enormous vortex of storms in a particular area that reacts to anger or other emotions. 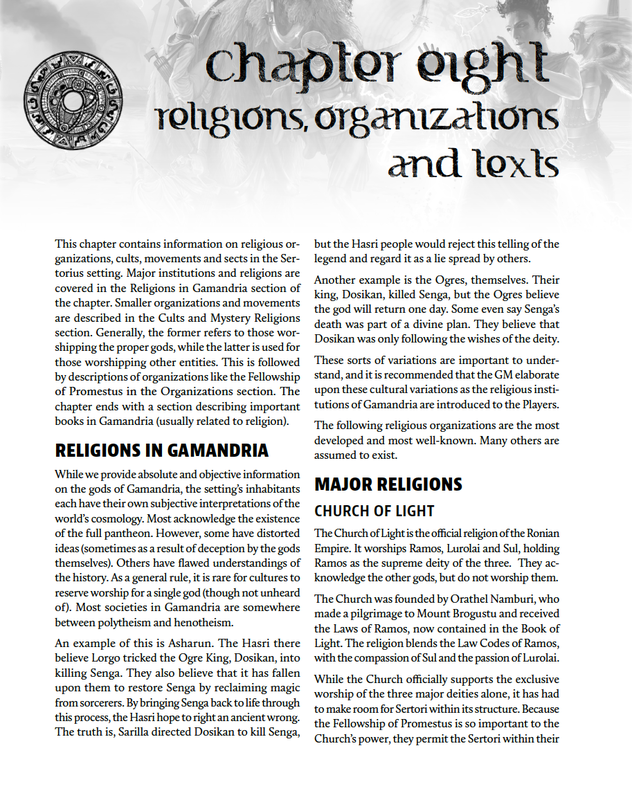 We cover religions and organizations in detail in Chapter Eight. 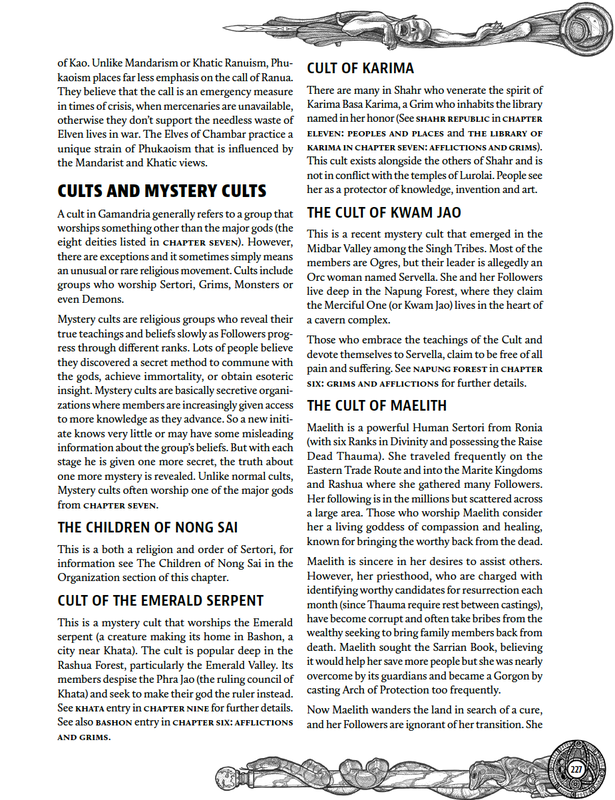 There are entries here on mystery cults as well as important texts. The equipment chapter covers everything from wages to weapons and trade goods. It also gives information on currency, musical instruments and transport. 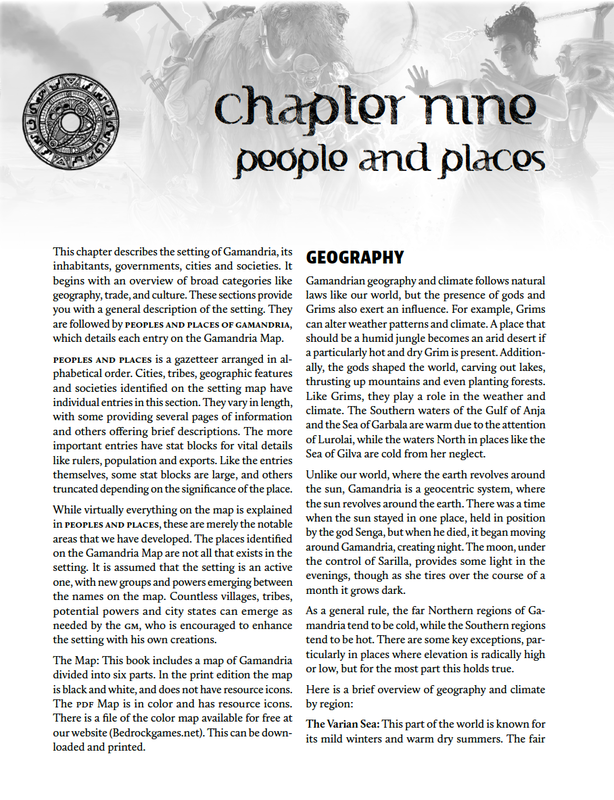 A large portion of the book is devoted to describing the setting of Gamandria. This includes maps, cultural information, cities, empires and kingdoms. 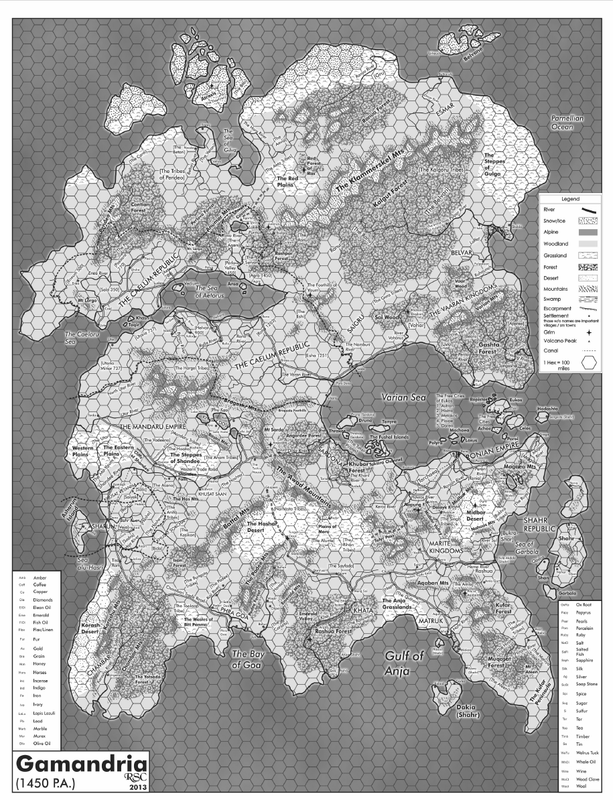 The maps are in color in the PDF and black and white in the print edition. 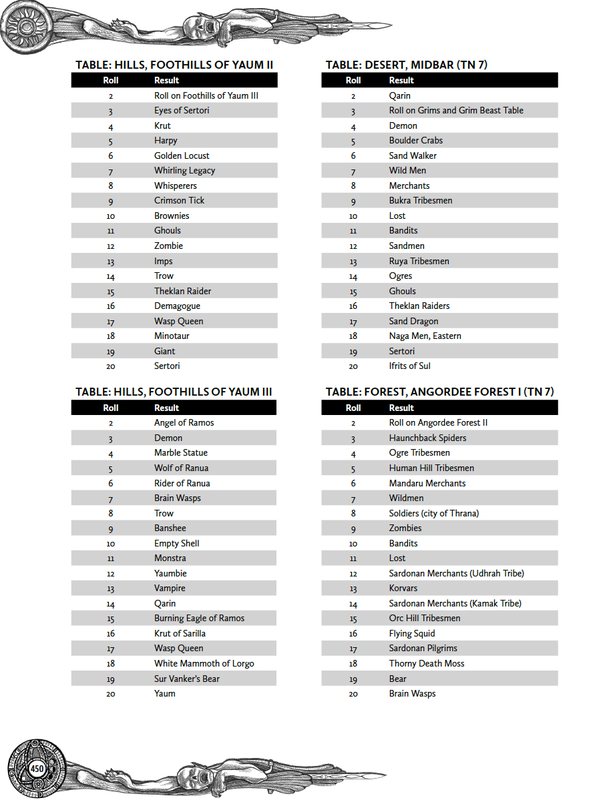 There are nearly 100 pages of monsters in the rulebook. These include threats ranging from Bandits to Demons to Banshees. Magical Objects are rare but powerful in Sertorius. 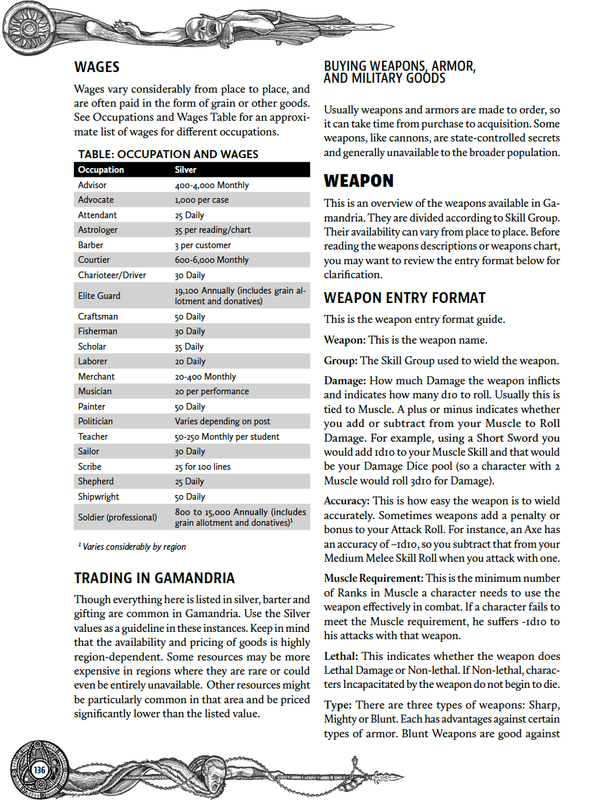 We include coverage of several major items in the rulebook. 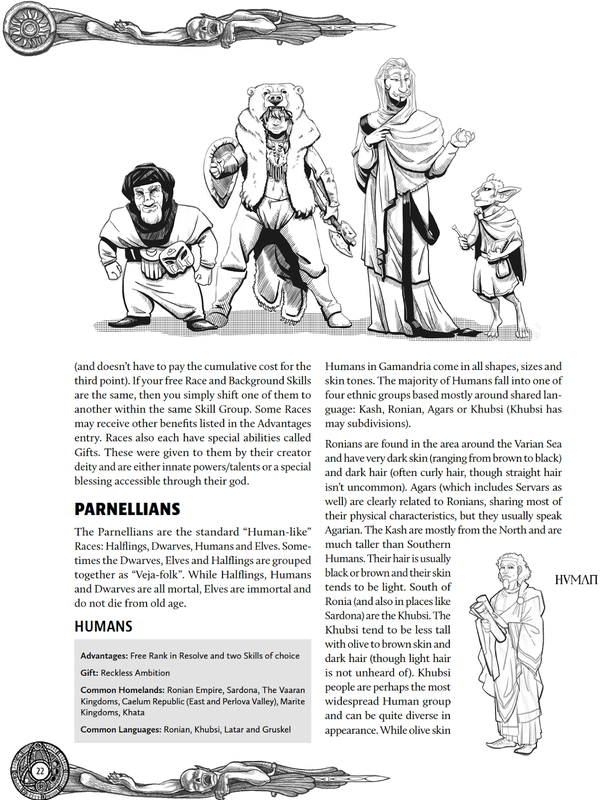 We provide some major NPCs from the setting as well as several sample Sertori. The entries for the NPCs follow our Present, Past and Future format in order to fit well with our Divination Skill rules. 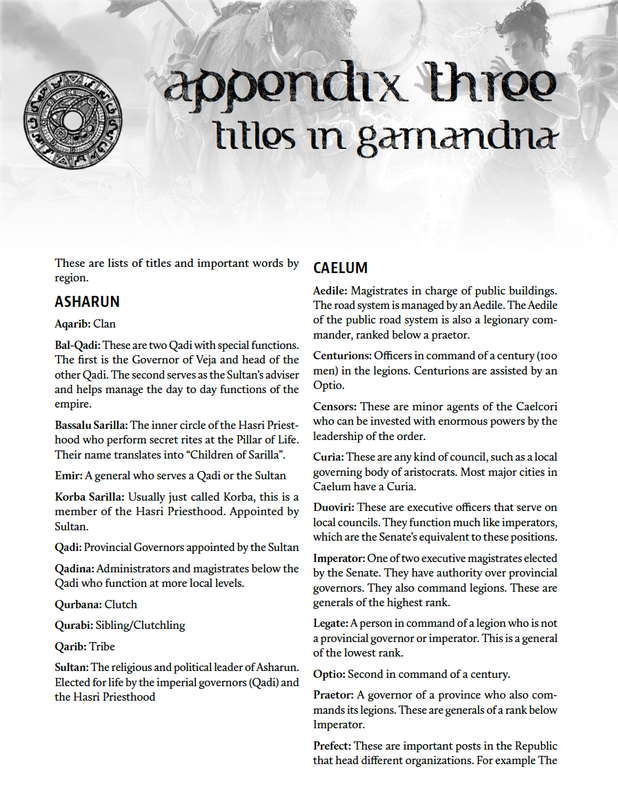 The Appendix includes encounter charts, lists of titles in Gamandria, sample king lists and a pronunciation guide.